You are here: Home » MEDIA » Books » Doctor Who: TARDIS Type 40 Instruction Manual by Richard Atkinson and Mike Tucker, illustrated by Bavin Rymill (book review). 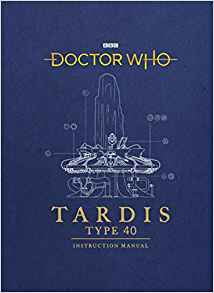 Doctor Who: TARDIS Type 40 Instruction Manual by Richard Atkinson and Mike Tucker, illustrated by Bavin Rymill (book review). The title ‘Doctor Who: TARDIS Type 40 Instruction Manual’ should give away what this book is about. Written by Richard Atkinson and Mike Tucker, the illustrations by Bavin Rymill cover areas where the photographs don’t cover. There’s also enough measurements for you to build your own control consoles, depending which Doctor’s version you prefer. The book has been linked into the TARDIS’ psychic printing so if you prefer to read it in one of the various languages of the various planets out there, I’m sure it will find you. Do Cybermen read in machine code? Over the eleven chapters you will look at the various aspects of the TARDIS operating systems, although not necessarily in chronological order. Mind you, significant changes in the Doctor’s TARDIS didn’t really happen until his ninth regeneration. On reflection, after reading this book, you aren’t exactly told which order to press buttons to get anything done, other than the main starting lever. Something I hadn’t picked up on before was the reason the TARDIS prefers its police box exterior is because the Doctor does act like an intergalactic policeman. Quite whether alien races appreciate that, I’ll have to leave to you to decide. It isn’t like you see other police call-boxes on alien planets. It is pointed out that one of the Doctor regenerations did conceal a key in a secret compartment in the TARDIS’ door although the latest regeneration either forgot or it’s no longer there. Although you might be familiar with some of the control rooms, it is handy to see them all under one cover, including that of the Master/Missy and the Rani’s own TARDIS. The Monk, by the way had an earlier model, the mark IV. There is no mention of the Warlord’s TARDISes in ‘The War Games’ which I did find odd as they moved away from the standard control console. Considering that both the Daleks and Cybermen use similar technology for their own time machines, it’s a shame examples of their machines weren’t included just to show that a TARDIS is not limited to Gallifreyans. One thing that did puzzle me. With stories outlined where there are significant details are given, the people and species are given at the beginning. Only Romana is given her full name. The other companions who use shortened names aren’t. I know it might cause some confusion to readers by doing that but it would have given a few seconds thought to place characters than speed read through them. If you think there are any references missed, then you will find them in ‘Chapter X: Troubleshooting’, although they aren’t identified to which source. Of course, my geek sense is likely to kick in from time to time to see if the authors have forgotten anything. The main one is from the Troughton period with the story ‘The Mind Robber’ where the TARDIS basically explodes. Having said that, this doesn’t take away from the rest of the book which hits on every where else. Of course, mapping where everything else is in the TARDIS is a bit difficult as even it moves rooms around and even loses them when it needs energy. There is more of an emphasis of what’s inside the TARDIS than any temporal theory but as that hasn’t quite stayed the same over the years, maybe a follow-up book on that subject would be worth considering. Don’t forget which lever to pull or button to press. « Back Issue #108 October 2018 (magazine review).